Eden Tyres & Servicing is a family-run business with a head office located in Derbyshire. Established back in 1981, the business has 17 retail branches in Derbyshire, Nottingham, Leicestershire and Rugby along with a thriving wholesale tyres department which delivers hundreds of tyres across the UK every day. Committed to providing honest advice and exceptional service, ETS aims to be market leaders by constantly adapting to customer demand and investing in the best staff training, and new, innovative technologies. TMO: How long have you worked at Eden Tyres & Servicing? JS: I started working for ETS back in 2008, initially as a receptionist in their busy Derby branch, before being promoted to Marketing & Social Media Manager around four years ago. TMO: Why did you choose to work at Eden Tyres & Servicing? JS: I chose to join the ETS team as I recognised that not only were they a friendly and supportive family-run business, but that they also had a very forward-thinking and professional approach. I was initially brought into the business to assist in improving the customer service in Derby, ensuring that we were efficient and approachable, particularly for female customers in this historically very male dominated environment. My career beforehand had been predominately in spas, and health and beauty, so this was a drastically different environment. At the time, my automotive knowledge was limited. However, I was confident there were aspects of my customer care background that would be an asset to the company. TMO: What do you most enjoy about your job and your work in the service and repair sector? JS: I’m lucky that in my current role of Marketing and Social Media Manager, there are many aspects that are very enjoyable and rewarding. Researching and improving our online buying experience is something that we are constantly working on and seeing these ideas translate into positive customer feedback and increased online sales is very rewarding. It’s also exciting to open a new branch (something we seem to be doing more and more frequently) and see the progression right from the initial planning stages through to an established and successful branch. TMO: What are your career highlights? JS: I’ve had many career highlights here at Eden Tyres, and my role is so varied that it’s difficult to pinpoint a favourite. I’ve been lucky enough to travel to Germany, Italy and Slovakia to test tyres. I even got to visit the Spanish Riding School in Vienna which, although not tyre related as such, was definitely a personal highlight. Getting to host customers at iconic places such as Mercedes-Benz World is always great, and the driving experience is also fun! More recently we have managed to raise over £24,000 for the Breast Cancer Research Foundation (BCRF) which is something we’re all very proud of, so much so that we’ve decided to continue the fundraising in 2019. TMO: What do you do to encourage more women to take up a role within a garage or the motor industry? JS: We try to ensure that women are included in both marketing and recruitment ads for ETS as we think this is an important message for both customers and potential team members. I think that women can bring so much to the motor industry and it’s a shame that the stereotypical male dominated image still puts many ladies off. Things are slowly changing though, after all 50% of our customers are female so I think it’s really important that women work within the business to make sure we have a balanced approach. We work hard in all aspects of the business to make the customer journey as pleasant as possible and the ladies that work within the ETS team really help us do this – the feedback we get from customers is always very positive. There are also excellent prospects for female employees, and we’ve had two ladies work successfully at Branch Manager level. TMO: How many female staff work for you, and in what roles? JS: We currently have 14 ladies that working within the business at Branch Manager level, in accounts, sales, as receptionists, and we even a trainee mechanic which proves this industry is changing and that it really isn’t just for the boys. TMO: What do you think the main challenges will be for your business this year? JS: Our main challenge is to continually develop ourselves to keep up with (and hopefully exceed) customer expectations. Consumers are increasingly short on time and require a service that is convenient and easy to access. The growth of online tyre retailers means we have to constantly be aware of our competition and ensure we adapt accordingly, be that with competitive prices, convenient online booking services or customer experiences within the branches. Fortunately, this continual improvement is something we all enjoy and thrive on. 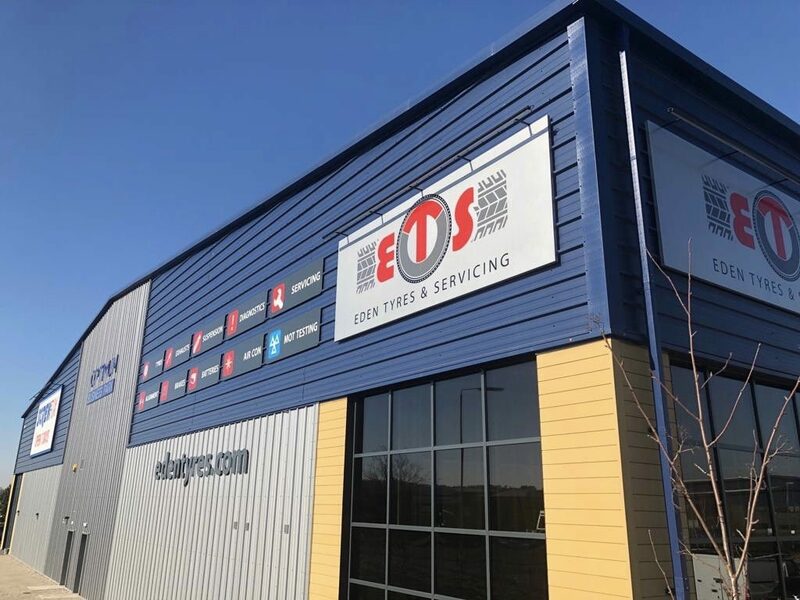 Now ETS is getting bigger (our 17th site opens this April), another challenge is that we retain our identity as a local family business that is known for honest advice and friendly, professional service, especially as we branch out into new areas we’re not so well known in. TMO: What approaches do you use, or what events do you run to make female customers more at ease with using a garage like yours (e.g. customer/open evenings)? JS: We run workshops/ladies evenings for local groups to learn skills such as checking tyres, oil and fluid levels. We make sure it’s fun and include refreshments and goody bags! I think having actress Lesley Joseph (Birds of a Feather’s Dorean) as the voice of our radio adverts also encourages ladies to use our services. Lesley really brings the ads to life with her flirtatious, cheeky style and we’re sure this really helps ladies feel at ease when visiting our branches. Of course we mustn’t forget our female customers themselves are often our best adverts. We regularly get fantastic feedback from ladies (we currently score 9.8 on TrustPilot and have over 4000 customer reviews) – sharing this on social media is a really strong message. TMO: How does your business benefit from being accredited to The Motor Ombudsman’s Motor Industry Code of Practice for Service and Repair? JS: I think being accredited to the Motor Industry Code of Practice for Service and Repair is a huge benefit to both ourselves and our customers. As a business, we have the security of knowing that if there is ever a problem, then we can turn to TMO for advice and support. Likewise, our customers benefit from the assurance of knowing that if there’s something they’re not happy with or feel needs investigating further, then they have an independent body of experts to turn to. We are committed to operating in as transparent a way as possible, and having an impartial organisation that can step in, enables us to do this and guarantees our customers’ fair treatment. Interview conducted in conjunction with International Women’s Day on 08 March 2019.